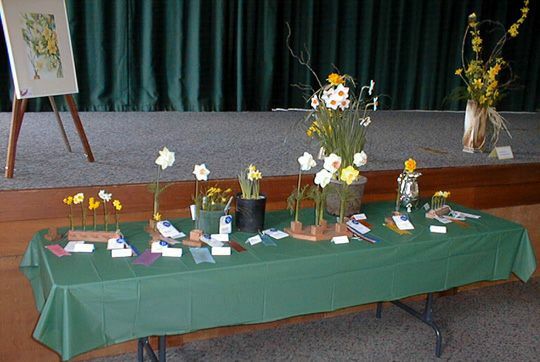 Below are the results of 1999 Livermore Show held on March 6th & 7th hosted by Alden Lane Nursery. 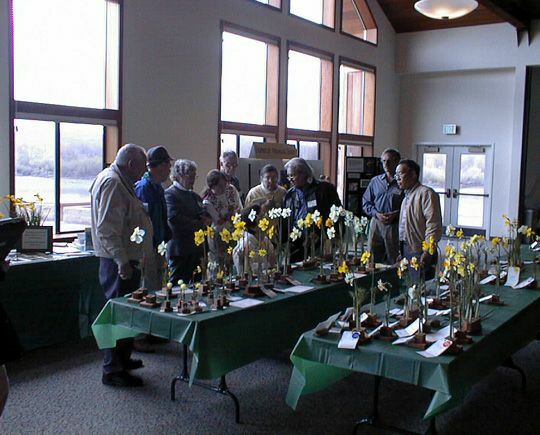 The Northern California Daffodil Society just had its first show of the season in Livermore (in the San Francisco bay area). The show was a week earlier than normal. In my town, the season is later than normal, although this is not true for the entire region. I had refrigerated a lot of bulbs last fall to get them to bloom earlier, and it worked. We have had a longer and colder winter than average, and this appears to have helped the red and orange cup daffodils as they had a deeper, more luminous color than usual. The cups on my Conestoga were almost entirely orange, and Bandit looked like its color code this year. Ben Hager who lives in Stockton in the San Joaquin Valley has been breeding red and orange cup daffodils for years. 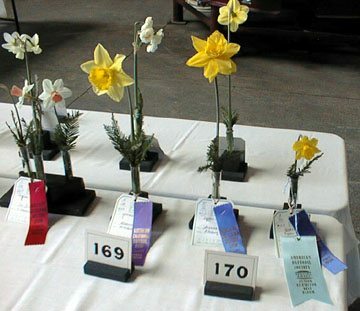 Indeed, we have an award named in his honor for a collection of five red or orange cup standard daffodils with yellow perianths. 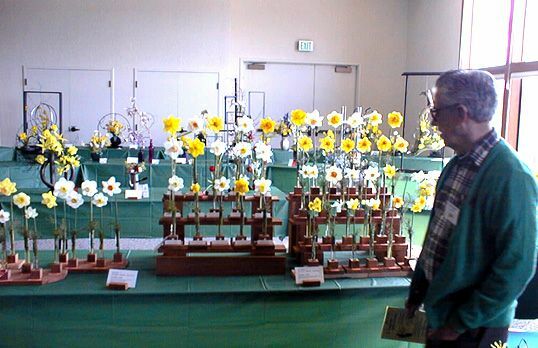 award, and one of his seedlings not only won the Rose ribbon but was also selected as the best American bred daffodil and reserve champion bloom for the show. 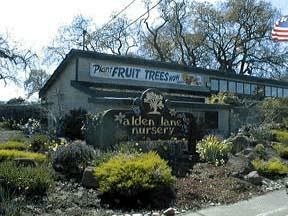 The show was held in a tent specially provided by Alden Lane Nursery at the nursery. The nursery also put a big banner atop their building to advertise the daffodil show. Between the nursery and our publicity chairman, we got the word out and drew more people to the nursery than would otherwise have been there. I’m glad to say this has been beneficial to our show as well as to the nursery. I should also add that the local garden club was active in organizing artistic design classes. 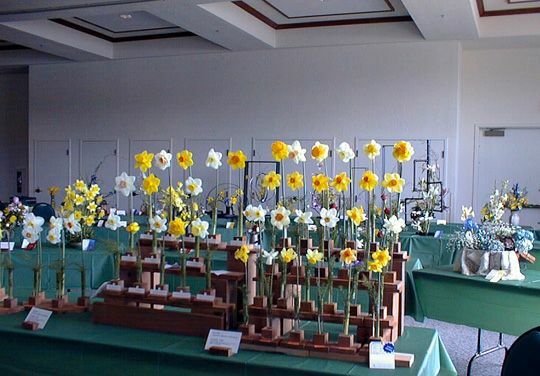 They had an accredited judge give them a workshop on arranging with daffodils the day before the show, and Sid DuBose graciously donated 30 dozen daffodils for their use. This allowed them to do designs with a lot of red cup and pink daffodils, not just yellow ones. Below is the preliminary report of the show. Color codes have not been verified against the Data Bank. The Northern California show uses Redwood sprigs for wedging the stems. Being initiated into daffodil showing by the boxwood regimes of the east coast, the Redwood seemed less odd this time around. The first time I tried using it several years back, I wondered what to do with such flamboyant foliage. However, my shears whacked it into shape and the effect worked quite well. staged mini gardens along the path to the show. Azaleas, Camellias and a very tempting display of tree peonies (with photo blooms) enticed. Daffodils however, were the order of the day. Despite worries about the early season, blooms filled many categories and the display tables were well furnished. My own efforts included a vase of three miniature “Wee Bees” that obliged by blooming through a brief snow before I left Washington. Also a surprise in Oakland were the amount of bloom from a healthy stand of Jetfire that provided another vase of three. Vases of three make a show look full in my mind even when they are as small as the “Wee Bee”s! Leaping to attention were the numerous seedlings contributed by the California growers. Division Two and Three both were subdivided to include seedlings in separate classes. Of special note, a div. 3O-ORR (?) by Ben Hager with an astounding round ROUND perianth brushed and burnished and glistening with color. Stan Baird pointed Ben’s blooms out to me. Unfortunately, I had to leave before the Judging was complete and there were others in Ben’s series including a striking div 2. How pleased I was that Bob Spotts featured a wonderful peach triandrus. But Bob laments that he has difficulty growing on his division 5’s. Alas! Bob Spotts, with some chagrin also noted the beautiful pots contributed by the Girl Scouts, of seedling bulbs he had culled and now wonders about. Hummm. .. One, albeit with a weak perianth, had the most glorious deep rose pink-lavender cup. Bob had “named” these various clones Eileen and other girls names so that they could be distinguished, but did not force the girls to use a list of numbers in order to show them. A good idea in this instance. myself and needed to live and drive across the bay for another adventure. Well the blooms begin. Have a great season everyone. 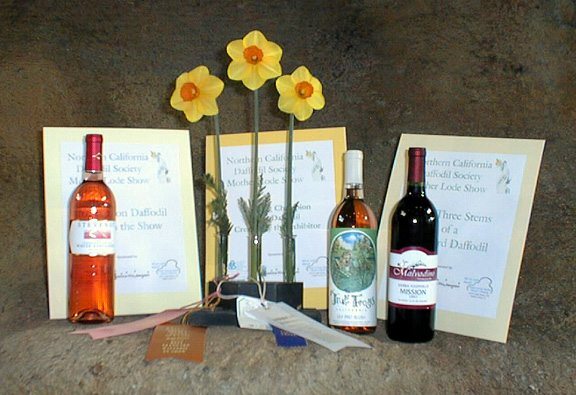 Below are the results of 4th Annual Mother Lode Show held March 13 & 14 and hosted by Kautz Ironstone Vineyard. Show Statistics: Count: 821 blooms, 398 exhibits and 16 exhibitors. GOLD RIBBON – Gold Ribbon, White Ribbon, and Rose Ribbon: Hager Sdlg D441 2Y-R (Ben Hager). Some of the miniatures exhibited. 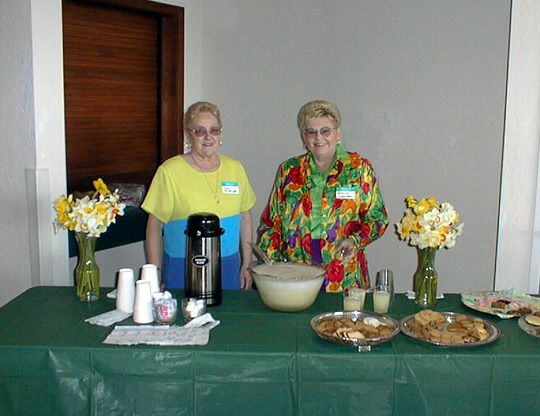 Our courtesy table manned by President Jan Moyers and Director Wayne Steele. The setting was nearly perfect and the weather was wonderful. The result was a most pleasurable daffodil show and weekend in beautiful, unique surroundings! The country vineyards setting had many thousands of naturalized daffodils blooming along the road to the winery and everywhere on the grounds. 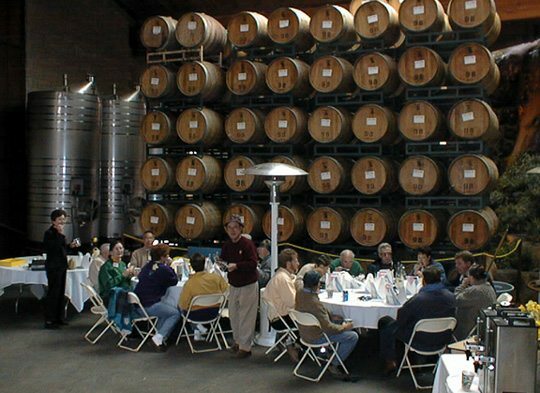 The buildings and grounds are intended to be the most beautiful winery complex in the State. Good food and wine was available at the deli and tasting room in the building two levels above the show. 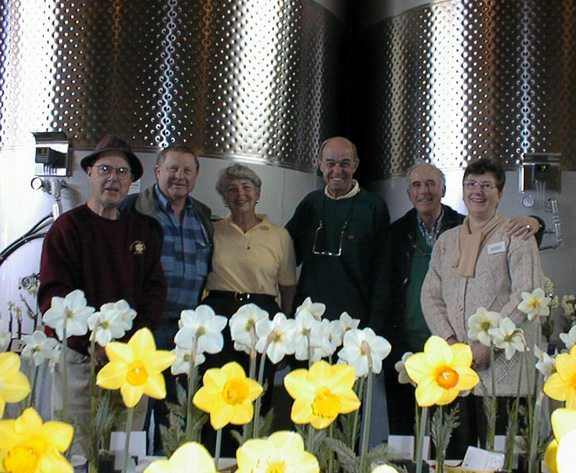 From left to right, Bob Spotts Show Chairman, John and Gail Kautz hosts for the Mother Lode Daffodil Show, Frank Rietvald a bulb supplier from Netherlands, and Tom and Maureen Handley, NCDS members from England. At the winery there were four hundred half-barrels of daffodils along the walkways. Each barrel had been brought to full bloom by the skilled winery’s grounds staff (kudos to Tracey Ellifritz and Larry Ringland). These displays were so breathtaking many visitors thought these were the show and some never got to the show floor itself! Just try to visualize a barrel of ‘Innovator 4O-O’ with at least 50 blooms open in full color. 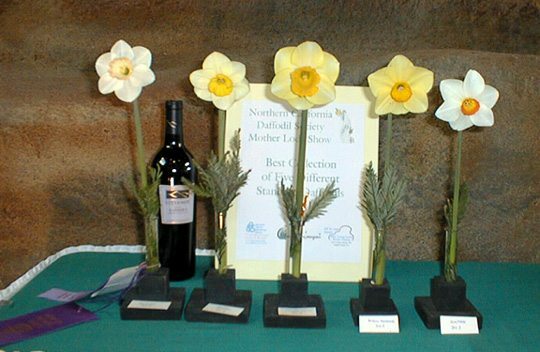 Some of the beautiful daffodils grown by winery grounds staff and displayed in the show area. 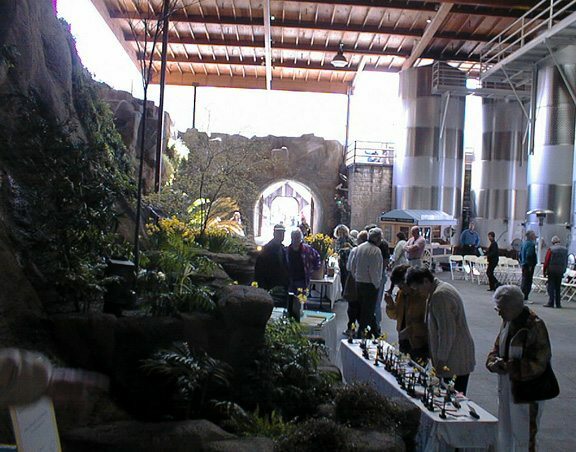 The show itself was staged on the winery (lower) working floor, in front of entry to the storage caves and next to the enormous fermenting tanks. It was a very effective area for display. The area was cool and the flowers responded by maintaining their substance throughout both days. The exhibitors dressed warmly while staging and occasionally retreated to the numerous propane reflective heaters placed for the purpose. The coffee pots were continually replenished. Every need anticipated and provided by Chris Gomez of the KIV staff. The awards area was on stage (to the left) above the show. 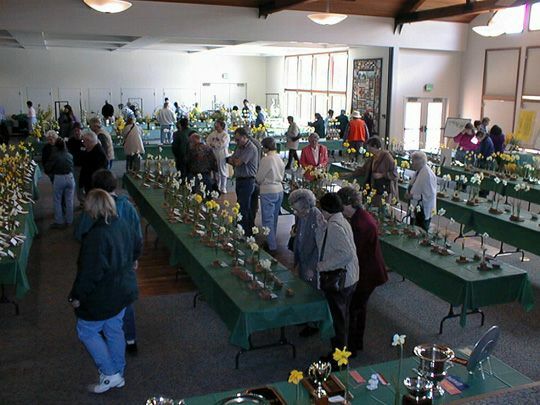 The Northern California Daffodil Society Show was an integral part of the KIV’s Spring Festival of Daffodils and Wine. With good publicity and wine-tasting available, there were good crowds both days. 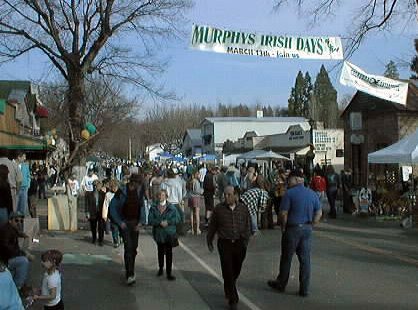 On Saturday, the nearby town of Murphys held its annual Saint Patrick’s Day celebration and a bus shuttled visitors between the town and winery. 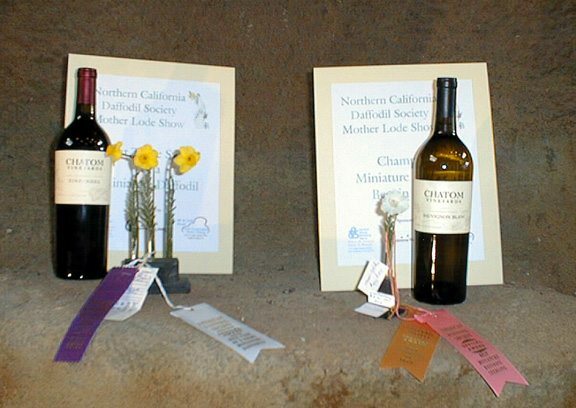 The Calaveras County Wine Association provided bottles of wine as prizes to the winners. KIV supplied the NCDS exhibitors and volunteers with wine Friday evening and Saturday lunch. The support given by the winery staff was extraordinary. Volunteer judges and clerks enjoying lunch provided by Kautz Ironstone Winery. 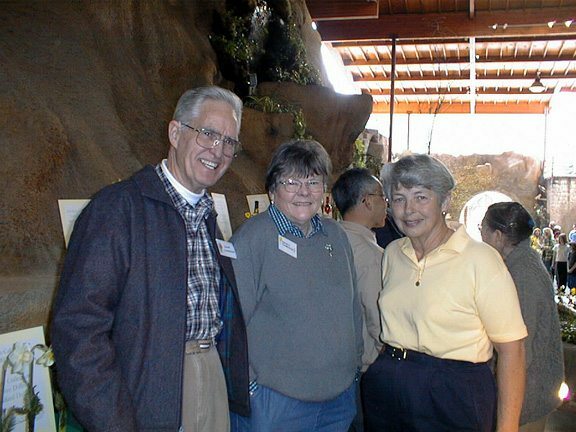 Show Chairman Bob Spotts in the foreground with President Jan Moyers to the left! The cooperation and effort of NCDS members requires special mention. Maureen and Tom Handley from London England (yes, England! ), Nancy and Gene Cameron from Newberg Oregon, Jan Moyers of San Rafael CA, Jane and Rich Hunt from Plymouth CA, Anna Rawls and Anna Fine from Livermore CA, Nancy Tackett from Martinez CA, Rich Nolette from Napa CA, Dian and Mike Keesee from Fortuna CA, and Stan Baird from Blue Lake CA – all came with few or no blooms from their own gardens and pitched in to stage the blooms brought from gardens in that were in bloom. As a result of their work the flowers of Sid DuBose and Ben Hager got their just rewards! This was especially meaningful because although his seedlings are having a spectacular year, Ben is in frail health and cannot transport flowers to the show or stage them. Ben is beaming at the results! Watch for future releases of Hager cultivars. The Sierra foothills region surrounding Murphys is covered with naturalized daffodils from remnants of miners’ and settlers’ gardens from the late 19th and early 20th centuries. Lore Gates of Vallecito, a new member, brought a wonderful large bouquet of historic double flowers in excellent condition and health. Our best guess is that they are ‘Butter ‘n’ Eggs’. Others living in the foothills brought ‘Van Sion’ from naturalized clumps a century old! 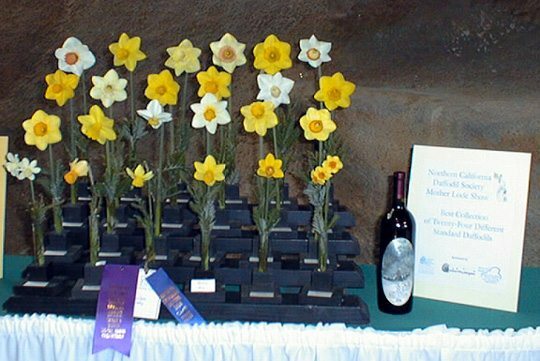 The Northern California Daffodil Society held its second show of this season last weekend at Kautz Ironstone Vineyards in Murphys, California. Murphys is one of the little historic towns from the Gold Rush era of the Mother Lode country. 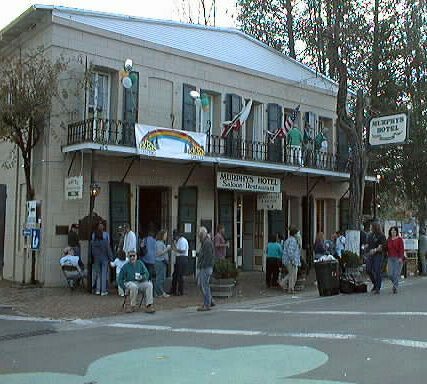 Murphys Hotel with shamrock painted at the intersection. 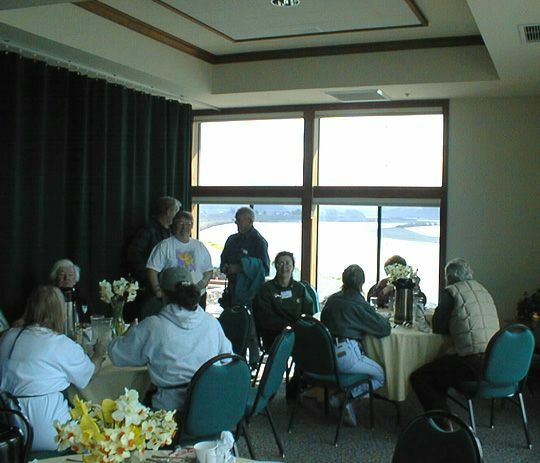 The winery at the vineyard is a very modern facility with banquet facilities, museum, and gift shop. Owner John Kautz loves daffodils and has planted thousands of them throughout the property and along the road sides. 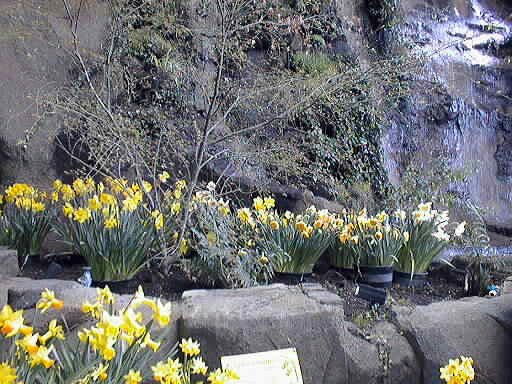 The public areas were decorated with countless containers of blooming daffodils. These were mostly 15 gallon cans, but there were some 5 gallon cans and some half barrels. Most of these daffodils were garden varieties available in large quantities, but I did see one 5 gallon pot and one 15 gallon pot full of Innovator which Harold mentioned in his posting. 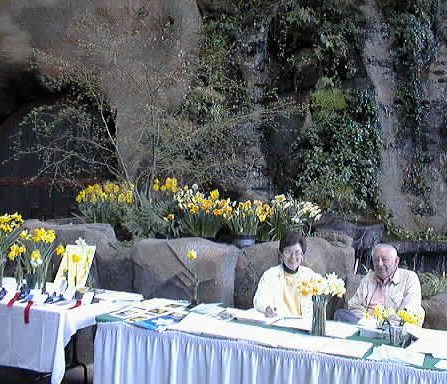 The daffodil show was located in the “cave” of the winery. This is the lowest floor where the fermentation tanks are. As the winery is built on a hillside, the cave is actually open to the outdoors on one side. 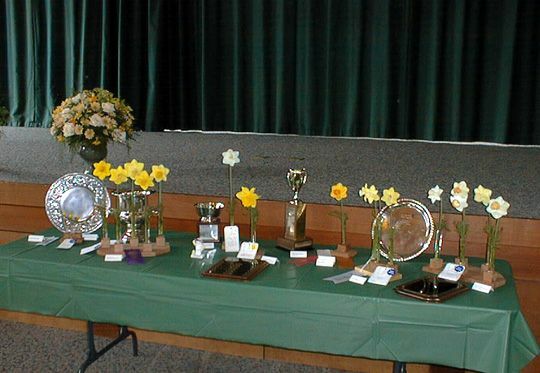 KIV was interested in having a daffodil show to complement their spring festival and provided us excellent logistical support. If you couldn’t attend this year’s show, you should come in 2000 on March 18 and 19. KIV is sponsoring the visit of a major daffodil personality. I won’t steal Bob Spotts’ thunder by telling you who it is, but I can assure you if you hadn’t planned on coming, this will change your mind! memorable flowers was a very nice triandrus hybrid of Bob Spotts with 3 shapely O-O florets. Did not win anything because of a nick in the cup -but excellent quality. Bob also showed some of his viridliflorus hybrids including a large dark green petalled flower with a solid green cup and a narrow contrasting yellow rim. Its petals are still a little narrow but it was a really stunning flower and a great breakthrough. Spotts told me he had flowered better things along those lines. One flower that the judges totally ignored but the laypeople really liked was a very large spidery flower of Bob’s with a red cup and long narrow yellow petals that were slightly reflexed – it was also from viridiflorus and my guess is that the regular gardeners would have bought that as a bulb before purchasing the champion bloom. Another stunning flower was Innovator, a new Dutch bulb, a 4O-R with petals are deep orange as any I had ever seen. But I must admit that in my garden the flowers had come a buffy fawn color. But up North they were spectacular and I did not recognize it for what it was. Nancy Wilson showed a fine N. cantabricus hybrid rather like N. can. petuniodes but with slightly wider petals. It won the Miniature Rose ribbon. She also showed a remarkable N. cant. petuniodes x triandrus that Wells had made. Both were crystalline white flowers, the latter had aflared but slightly incurving cup. Both will be high on my list of miniature wants. 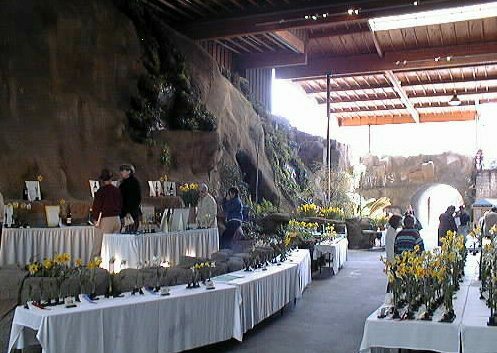 One thing that I found outstanding and unique was the physical location of the Daffodil Show at Kautz Ironstone Vineyards. The “cave” Kirby’s post mentioned serves as a wine aging room. As mentioned it is open to the air at one end. The “cave” is lined with two story high, stainless steel wine tanks that are kept at about 40 degrees ( some higher, some lower ). At one end is a large wall of wine barrels arranged in a traditional solera. The inside of the walls have been finished to look like a cave sort of like at Disneyland. 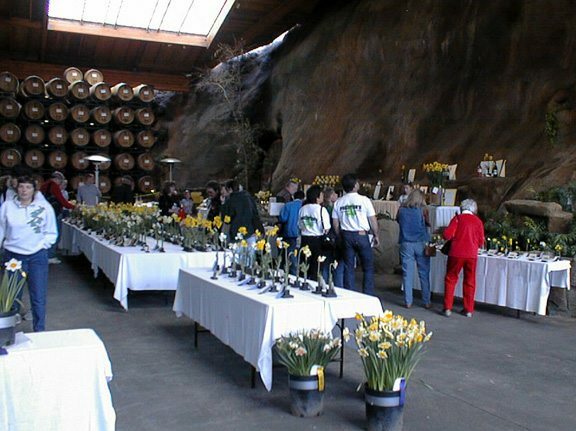 The flowers were staged in a large open area which is subject to high traffic from the winery tours. The flowers in the show could not have had a better place to have been staged. The lighting is on the dim side but quite sufficient. The cool, constant temperature allowed every flower to “hold” at the peak of freshness. It was like staging a show in a giant florists cooler. Truly a privilege to stage flowers in such unusually ideal conditions. I bet that in this location, the show could run for a week from the flowers standpoint. Applause to all the NCDS Members for developing a new Daffodil Show in what may be one of the most ideal settings I have ever seen! 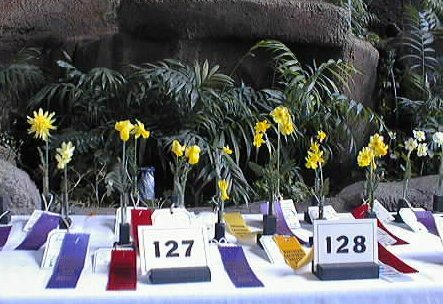 Below are the results of 24th Annual Daffodil Show “A Daffodil Spectacular” hosted by the Fortuna Garden Club on March 20th & 21th. Daffodils on TV! 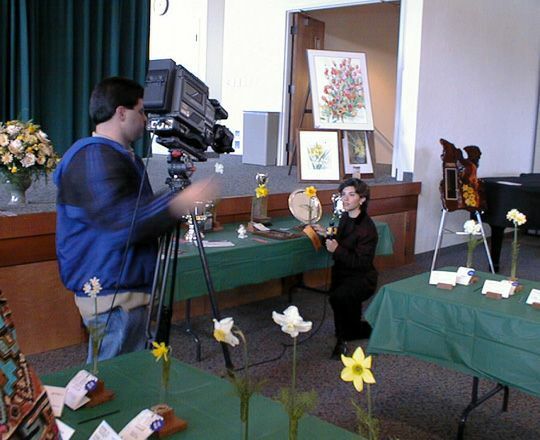 This daffodil show was on the 11:00 news! conference facility in Fortuna, a small town in the northwest of California. 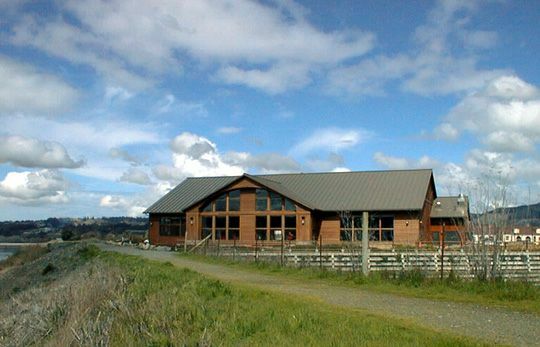 The building is situated along the Eel River with great scenic views across the river. Those of you planning to take the pre-convention tour from San Franciso to Portland next year will get to see the Fortuna show and will be glad you did!